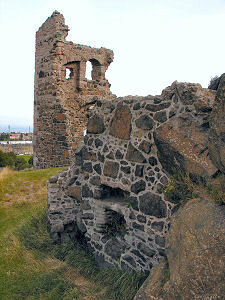 The only building in the central area of Edinburgh's Holyrood Park is St Anthony's Chapel. 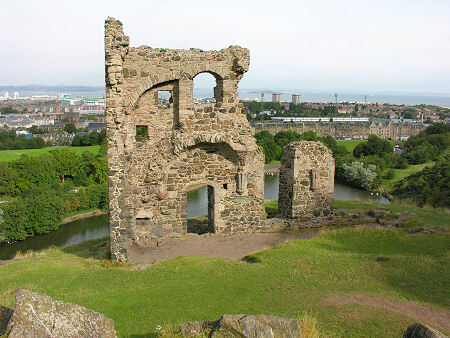 Looking more like the gaunt ruin of an ancient castle than a religious building, it stands on a rocky outcrop high above St Margaret's Loch, commanding excellent views over North Edinburgh, Leith and the River Forth. For a building whose construction must have been witnessed by people for miles around, surprisingly little is known about the origins of St Anthony's Chapel. 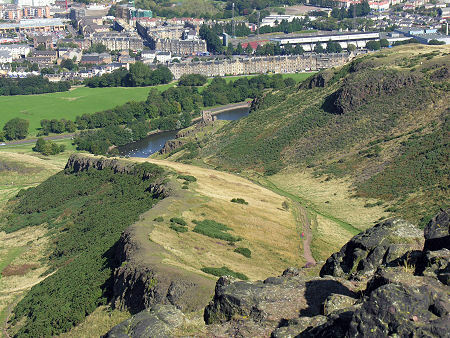 From the 1100s, ownership of the land now forming Holyrood Park was divided between the abbeys at Kelso and Holyrood, and it is thought that the area occupied by the chapel was owned by Kelso Abbey. Despite this, it seems very likely that St Anthony's Chapel was closely associated with Holyrood Abbey, which stood just a few hundred yards away to the north west. 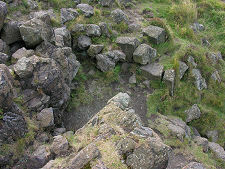 The two were linked by a well-made stone track (now heavily worn) with prominent kerbstones that can in places still be seen, and about three quarters of the way along this track up to the chapel is the spring and carved stone bowl known as St Anthony's Well. 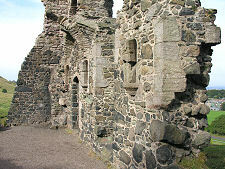 It's tempting to think of St Anthony's Chapel as an outlying chapel for Holyrood Abbey, perhaps constructed as a means of getting pilgrims out from under the feet of the monks in the abbey. 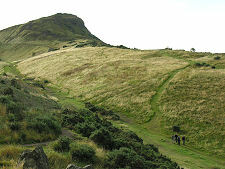 It has also been suggested that the chapel served as a sort of religious beacon, designed to be clearly visible to sea-borne pilgrims coming to Holyrood Abbey as they sailed up the River Forth. As for dating, there are references to a grant paid for repairs to St Anthony's Chapel by the Pope in 1426, suggesting the building could date back into the 1300s or beyond. Details of its demise are equally unclear, but presumably, like Holyrood Abbey itself, St Anthony's Chapel fell into disuse and disrepair after the Reformation in 1560. Today, all that remains of the chapel are parts of the north wall plus remnants of another building a little to the south west, which has sometimes been called a hermitage but was probably just a store room. 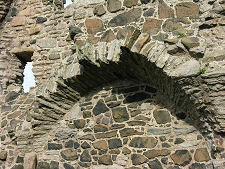 The remaining chapel wall shows signs of vaulting, and it is thought that when complete the building would have comprised a small three-bay chapel, with a three-storey tower at its west end. This odd shape, almost as tall as it was long, supports the idea that the chapel was designed as much to ensure distant visibility as to accommodate worshippers. 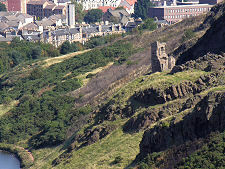 For today's visitor, St Anthony's Chapel is a fascinating and rather mysterious feature of Holyrood Park. 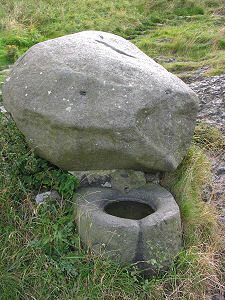 It is fairly accessible to the reasonably fit: though this is something that can have a down side as well as an up side. As a result of its accessibility it is still possible to find relics of monks here, though the monks of Buckfast Abbey rather than Holyrood Abbey. 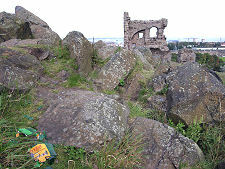 On our last visit the smashed glass of a green Buckfast Tonic Wine bottle graced the rocky outcrop to the south of the chapel. There is an active debate in Scotland about the impact of this cost-effective means of purchasing alcohol on the health of many of the county's poorer communities. The result of it being sold in glass rather than plastic bottles is not a matter for debate: it is obvious from the state of the gutters and pavements of too many Scottish towns on too many Saturday and Sunday mornings. Or, sadly, anywhere else in the country accessible without too much effort by someone carrying a bottle of "Buckie": like here.